Altgeld Hall, originally known as the Library Building, is one of the oldest and most unique buildings on campus. Dedicated on June 8th, 1897, it was designed by Professor Nathan Ricker, the first person to receive a degree in architecture both from the University of Illinois and in the United States, and Professor James McLaren White. Altgeld Hall held the library until 1927, and from 1927 until 1955 it served the Law Department. From 1955 to present day it houses the Mathematics Department and Mathematics Library. 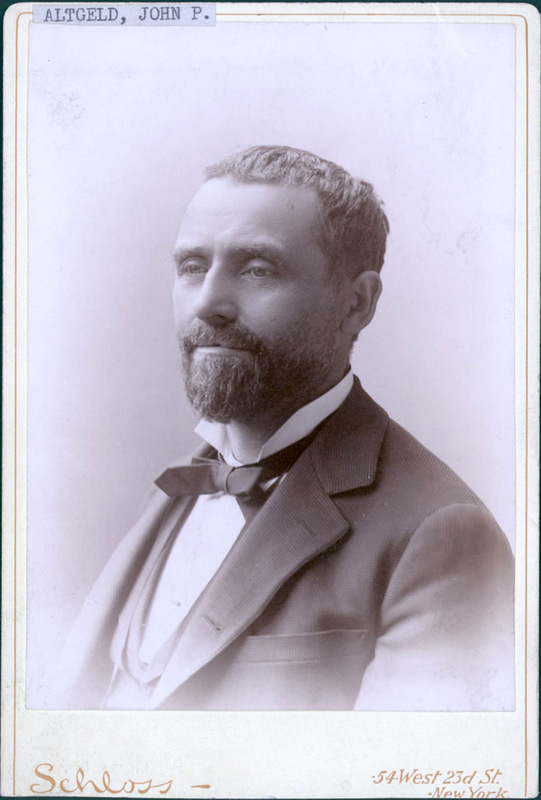 John Peter Altgeld, Governor of Illinois from 1893-1897, was a strong supporter of the still young University of Illinois, and dedicated as much financial support to the University as was possible. Altgeld had struggled for an education himself, having been brought to America as an infant by illiterate German parents and working his way up from unskilled labor to law school. The President of the University of Illinois at the time, Andrew Sloan Draper, wrote that the Governor "stood by the University in the hour of her first great growth and of her imperative need; he exerted the powers of his great office in her behalf to the very limits; and while all the friends of that University, now grown great, may dissent with some of his opinions, no one of them is at liberty to speak unkindly of him." Some of those opinions may have to do with Altgeld's preferred architectural aesthetics, as Altgeld was strongly in favor of a Tudor-Gothic style with towers. Initially, the Building Committee issued invitations to architects to enter into competition, with the only stipulation being that the building be fireproof throughout. The winner of the competition, Edward G. Bolles from Springfield, Illinois, was eventually terminated due to his lack of construction supervisory experience. The Building Committee then decided to reject all of the competition entries, and hire the prominent architectural firm of D.H. Burham. Numerous letters between Burnham, President Draper, and the chair of the Building Committee, Colonel Richard P. Morgan, indicated tension regarding Altgeld's vision regarding the new library building. Draper wrote, "The Governor does not seem to be having his way in the matter of the plans and I feel sure that in the end his way will prove to be a good way" (Scheinman 16). Burnham presented his designs to the Building Committee on December 11, 1895. While the Governor was unable to attend the presentation, the committee was unable to approve the Tudor-Gothic style favored by Altgeld due to the cost estimates being considerably higher. Undaunted, Altgeld called for a special session, but Burnham unexpectedly resigned. As a result, the University's own architecture staff was asked to present designs, and Professors Ricker and White produced a Romanesque plan that was accepted on February 4th, 1896. While Henry Hobson Richardson had died a decade earlier, marking the end of the popularity of Richardson-Romanesque architecture, the style still persisted. Professor White termed the Library Building's style "Modern Romanesque," and said that it derived from medieval church architecture. 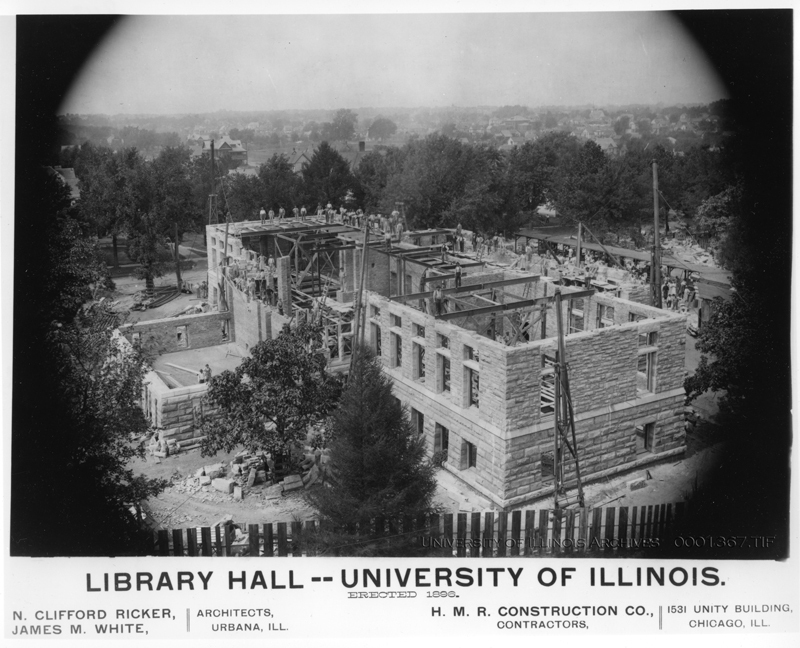 The Library Building, now Altgeld Hall, was a three story structure with the basement containing museums, the middle floor containing the library rooms, and the second floor devoted to offices and seminar rooms. Ricker and White considered the color of the exterior of the building to be of great importance, and so randomly placed hard pink sandstone from the Kettle River quarry in Minnesota was used. Weathering has changed the color to more of a buff color, but the pink can still be seen inside the east entrance. 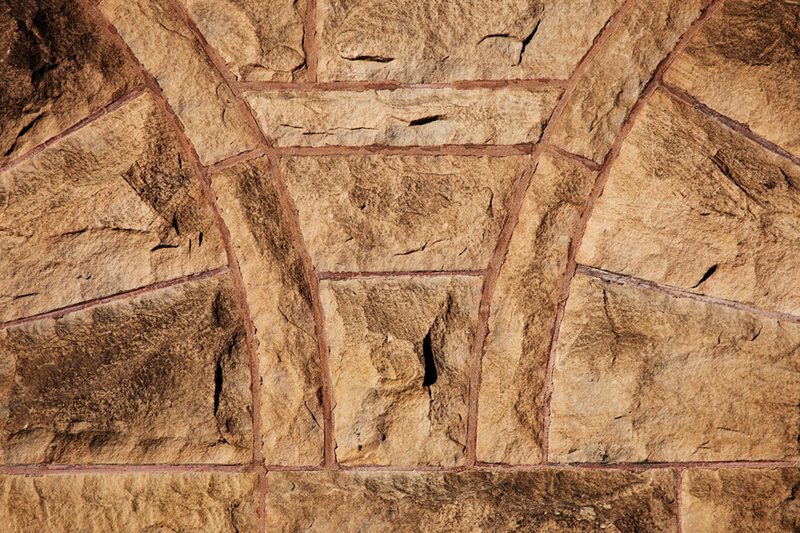 The stone was cut at the quarry into ashlar, and the carving was done after the stone was in place on the building. This was a time consuming process, as it took the construction team 2 days just to finish the clustered columns in the tower. Altgeld hall is home to the only gargoyle on campus. Newton A. 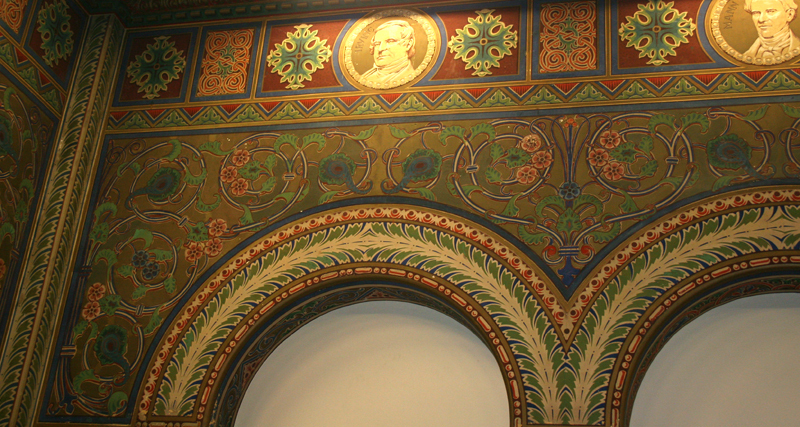 Wells designed and executed the painted decorations for the interior of Altgeld Hall, including the four murals decorating the rotunda of the Mathematics Library (read more about "The Four Colleges: Literature and Arts, Agriculture, Science, and Engineering" in the University of Illinois Urbana Champaign Arts tour). Wells was influenced by the long-established European tradition of integrating frescoes and other painted decorations into the design of public buildings, and painted stylized organic forms and floral decorations onto the walls. Aware of the importance of color, Wells used a pale green, dark red, and light blue for architectural details, and added a faded pink to his palette for the floral decorations. In addition, nearly every capital, arch, frieze, wall, and medallion was embellished with "artificial pear oil," which has an appearance similar to that of gold. As the rotunda once had a skylight, Wells wrote that "no matter where one stands in the rotunda, there will be some portion of the gilding that reflects the light from above" (Scheinman 37). One of the notable features of Altgeld Hall is the bell tower, also called the Senior Memorial Chime, which was dedicated on Homecoming day, 1920.. It houses a set of 15 chimes that were gifts from the graduating classes 1914 - 1921. The set of chimes does not include D# and F natural, neither of which are needed to play the Illinois fight songs, so when the Chimesmaster receives requests to play often times modifications to the song must be made. The bells total weigh over seven and a half tons, with the smallest bell weighing 500 pounds and the largest weighing 3,000 pounds. Performances can be heard of the bells from 12:50 to 1:00 pm Monday - Friday during the school year. The current Chimesmaster is Sue Wood. Altgeld was a significant structure in its time, as it was considered evidence that "the ‘cow college' of 1868 had been transformed into an institution of higher education worthy of a place in the ranks of the select" (Scheinman 64). In 1941, recognition of John Peter Altgeld's dedication to both the University was belatedly given in the renaming of Library Hall to Altgeld Hall. A tablet in Altgeld Hall reads: "Because of his insight into the essential relations between education and the state, his term as Governor and Trustee marks an epoch in the history of the University of Illinois. This buidling, in the planning of which he took an active part, originally housed the University Library. The College of Law, in the organization of which he was also deeply intereted, occipied it since 1927. In recognition of his services to the University the Trustees of the University have named the building Altgeld Hall." 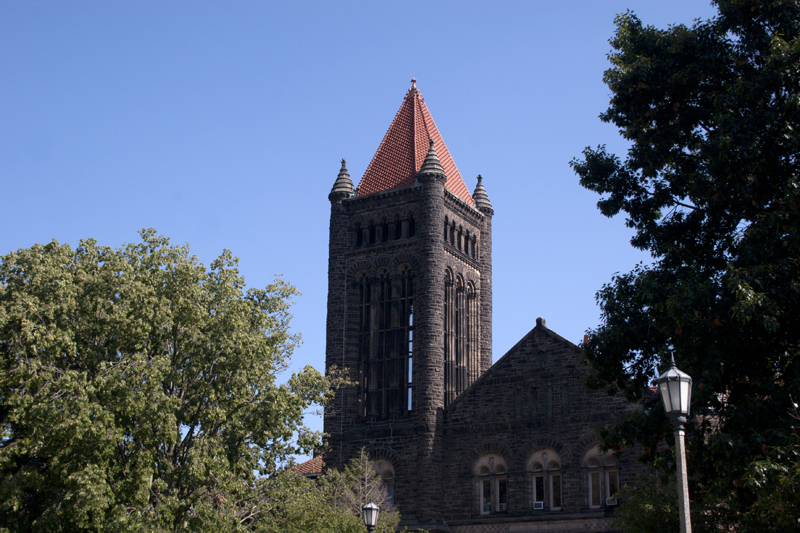 Altgeld Hall was placed on the National Historic Register in 1970. Interior decoration by Newton A. Wells: The interior of Altgeld Hall is painted with floral decorations and stylized organic forms, as well as medallion portraits. At President Draper's suggestion, medallion portraits of "America's greatest soldiers, statesmen and scholars" were placed in a frieze extending around the first floor of the rotunda. Conceived in Classical Roman style, the portraits represent Hamilton, Fulton, Irving, Mann, Lincoln, Grant, Bryant, Agassiz, Hawthorne, Bancroft, Hudson, Bradford, Washington, Franklin, and Stuart. Source: Scheinman, Muriel. (1969). Altgeld Hall, the original library building at the University of Illinois: its history, architecture, and art. Urbana, Illinois: the University of Illinois Urbana-Champaign. 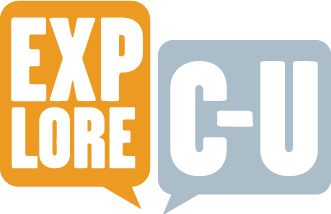 “Altgeld Hall,” ExploreCU, accessed April 21, 2019, https://explorecu.org/items/show/177.